Eberhard Weber is a German double bassist and composer. As a bass player, Weber is known for his highly distinctive tone and phrasing. Weber's compositions blend chamber jazz, European classical music, minimalism and ambient music, and are regarded as characteristic examples of the ECM Records sound. 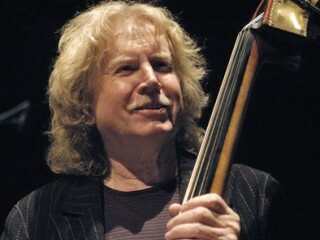 Eberhard Weber's distinctive bass playing and compositional skills have earned him critical accolades and invitations to collaborate with a variety of musicians in the worlds of jazz and popular music, including vibraphonist Gary Burton; guitarists Baden Powell, Stephane Grappelli, Pat Metheny and Ralph Towner; saxophonist Jan Garbarek; and songwriter and singer Kate Bush. With the release of his first solo record for ECM in 1973, The Colours of Chloe, Weber differentiated himself from other jazz and fusion bassists by eschewing walking bass lines that recall such American musical forms as rhythm and blues, jazz, and blues. Instead of using the bass to create the rhythm of a musical piece, Weber focused on using his instrument to create a distinctive melody, which has prompted comparisons to contemporary classical and new music, and has classified his music as distinctly European. Weber achieved his distinctive bass sound by adding a fifth string to his electric bass in the early 1970s. Later in that same decade, he added a sixth string in order to expand his aural palette. For Weber's 2001 album, Endless Days, the bass player requested that his guest musicians--including McCandless, pianist Rainer Bruninghaus, and drummer Michael DiPasqua--"play everything, as long as it doesn't sound like jazz," resulting in an album that more resembles classical chamber music, with McCandless performing tenor saxophone on only one song, and performing oboe, English horn, and bass clarinet on the remaining songs. The presence of DiPasqua on Endless Days is notable for ending the drummer's 14 years of retirement, and provided the occasion for 52nd Street critic Don Williamson to note: "While Bruninghaus often fades into the overall scenic perspectives that Weber establishes, especially on the chordless descending notes of 'Nuit Blanche'--or while McCandless and Bruninghaus create a long-toned orchestral effect on 'The Last Stage of a Long Journey'--it's DiPasqua who fills in the finishing touches with a limited martial beat or with splashes and shimmers. The ethereality of the works finally are tethered once DiPasqua defines their rhythmic bases." Williamson noted that DiPasqua was convinced to join the project after hearing Weber's tapes of the album's compositions, and regarded the album as further evidence of Weber's professional accomplishments, which he described: "Far removed from the crusty Ken Burns concept of jazz, Eberhard Weber's advancement of the form depends upon a European view that values reflection as much as impetuousness, omnivorous absorption of numerous styles as much as adherence to a rigid form and logic as much as creativity. Endless Days confirms the uniqueness of Weber's style as he develops an even broader imaginative expansion." As of June 2007, reports have surfaced that Weber has suffered a stroke and is currently unable to perform. In a January 2010 interview with Die Welt, he spoke about his medical condition and future projects. Weber was awarded the prestigious Albert Mangelsdorff-Preis in November, 2009. A box set of his 1970's works with Colours was released by ECM Records the same month.